Home > Household Deals > Tide Deal | Makes it 10¢ Per Load! 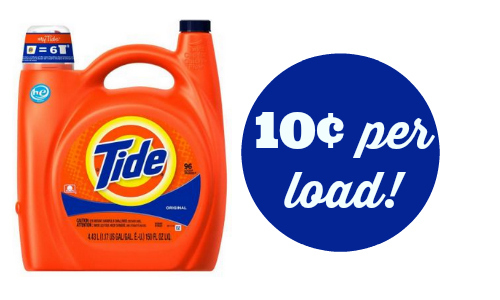 Tide Deal | Makes it 10¢ Per Load! Today only, get a huge bottle of Tide for $9.98! That is 96 loads, which makes it 10¢ per load. If you head to the store to get the deal (I would go soon), you can use a coupon to make it $8.98, which is 9¢ per load. I personally wouldn’t worry about the coupon and would just order the deal while it’s available. You can order online and select in-store pick-up or shop in-store. The deal is valid today, 4/16, only, but I will not be surprised if it sells out. See more laundry detergent deals.